This page was originally referred to a singular and especially gruesome massacre of March 25, 2013. But now it has been re-purposed to cover a broader pattern of extremely similar massacre in Abel and the general area into the following days. Between the 25th, and two sizable massacres of the same type on at least the 27th and 29th of March as well, it seems this special subset of the Homs Massacres claimed at least 102 civilians, per opposition-assembled lists, collated together. In each case the pattern is this: entire families, short on fighting age men and long of women, younger children as young as 1, and elderly people as old as 98, are imprisoned by some armed gang, slaughtered, beheaded, somehow broken in pieces, then charred to high degree. The area, or main area, of the massacres is reportedly the farmland around the town of Abel (Abil, آبل - means Apple) just south of Homs. The same area was the site of a large massacre a year earlier, on February 27, 2012 (see below, at the exact time rebel forces finally fled the army victory in Baba Amr district (announced on the 28th). They fled mainly to the south, towards Abel. This 2013 massacre came exactly as rebels bitterly fled the district again, to the south, with the final push on March 24 and the brutal slayings beginning the next day. Rebels in this natural fall-back spot were the first to find these bodies on the 25th, and film them for shock and propaganda value, already identified the same day "by relatives." It was the first news report in five days from the opposition Baba Amro News. They didn't report on the fall of Baba Amr or their retreat, only when they could again go on the offensive with an alleged regime crime. That they got another scoop with a repeat on the 29th, as rebels remained dug-in in the area "under government control" only adds to this troubling subtext. Precisely which Shi'ite villains were responsible for the killings is not entirely clear from the Sunni opposition reports. Baba Amro News reported "the regime’s shabiha attempted to storm Abel village in the suburbs of Homs, and the Free Syrian Army fought them back. As the shabiha were withdrawing from the area," they committed the massacre, and hastily left the bodies behind for rebels to find. The March 29 follow-on massacre was blamed by activists on "Assad gangs and Hezbollah forces who took control of the farmlands. "In fact, it was the second one in a week by the same parties, that rebels had direct proof of, anyway. Suggested here is a plastic interchangeablity between (Alawi/Shia) Shabiha and (shia) Hezbollah in the Sunni extremist cosmology. 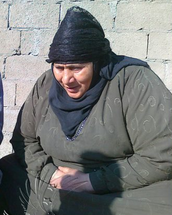 This blame-shifting video has not been shared yet that we know of, but there were photos too, with only one made available so far: a heavy-set older woman, shown looking utterly doomed before death (inset, above). Activists seem pretty sure, the same woman is one of the charred bodies, making a before-and-after image from the two with the Baba Amro News story. Do consider that is a real Human being here, someone's mother, cowering in the shadow of captors whose identity we must consider murky. In the opposition narrative, these killers apparently vanish each time, like the shadows they only appear as here. 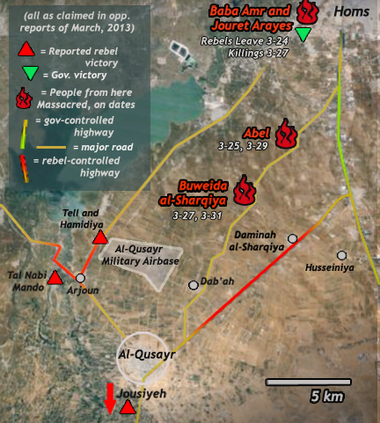 Interestingly, like the later case studied here, this incident coincided with a rebel loss in Baba Amr. Just as the area was announced clear of rebels the day before the 2013 massacre, it was on the day after the 2012 massacre, February 28, that Baba Amr was declared clear. The same time yielded also its big-massacre 2012 equivalent of the March 27 massacre back in Baba Amr. 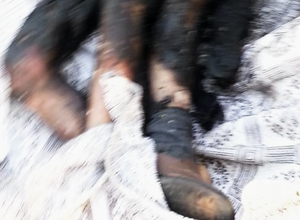 The ambiguous Sultaniya Massacre of Feb. 29/March 1 claimed app. 40 victims from select families. All are listed as from Baba Amr, implicitly killed there, but sometimes filmed by rebels who'd already left. That would change in 2013, with no video. Nonetheless, retreating, enraged rebel brigades of Baba Amr will here be considered suspects in all these similar cases. The 2012 massacre victims include family names of interest: Janseiz/Janseez x3, Halabi x3, al-Zoubi, Beirini, Kakhia, Melhem, etc., with little to no family grouping, for the hospital finds. Families al-Raay (x6), Melhem (x7), Sabouh (x6), Ibrahim, Suleiman, etc. make up the "Sultaniya Massacre." Among those, only the name Sabouh stands out for being targeted for several martyrs in both 2012 and 2013 (9 members killed on March 27, inside Baba Amr they say). But that one commonality is clearly pretty interesting, although we can't be sure at all what it means. This page was last edited on 30 January 2014, at 13:42.